"This material feels smoother to me. The feeling is much more pleasant than the first one" states Sara, who is participating in a blind test conducted by Raul Funes, an engineer in the SEAT Haptics department (interaction involving touch). There is a group of professionals at SEAT who are devoted to studying and perfecting the sensations felt by users when they touch the interior elements of a car. The work carried out by Raul and his team involves the "material world" and sense perceptions. Although it may seem somewhat subjective and difficult to assess, in fact everything is perfectly gauged: "We put in more than three years of work before a car goes on sale", explains Raul. 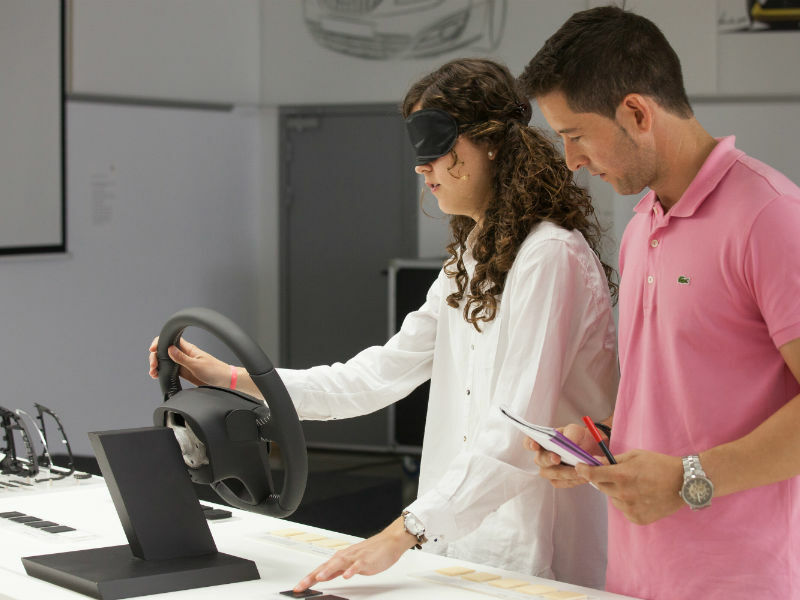 In order to increase the objectivity of sensorial opinions, we carry out more than 150 blind tests on car parts every year:"We blindfold the person performing the test so they can fully concentrate on tactile inputs. This is an example of how we analyse and scale the glide factor and consistency of certain materials''. And what is the purpose of all this testing? To offer a feeling of authentic quality through the use of touch. "Whichever button people touch, they all have to offer the same feeling of consistency. The results of our work can be felt in the small details and overall impression given by the car". Haptics is in constant evolution and also adapts to the technologies of the future. Nowadays, the trend is for individual buttons to disappear now that touchscreens are gaining in popularity. In this sense, Raul's department is focussing on defining the amount of pressure that customers have to apply to the screen or on making sure that the layout of all elements is consistent with natural human movement. Likewise, another area they work on with haptics is in defining the spaces to house objects commonly used by drivers, suc h as a phone, umbrella or laptop. The objective is to design a logical and useful space for storing items, bring spatial order to the interior of the car and ensure functionality. Achieving the perfect surface feel that a car should provide to its customers is truly a "one-of­ a-kind job", says Raul. So much so, that every time he explains what he does, he gets asked "do people really scrutinise every little detail on a car?"